In keeping with my effort to highlight books I’ve enjoyed in the year they’re published, and not leave it to the last-minute awards season to recommend them, here are a few recent reads I loved and I hope others might love, too. First up, Lara Elena Donnelly’s debut novel, Amberlough. From the first, I was absolutely captivated by the stunning cover art for this book, and found myself looking forward to it without knowing anything about it. After reading it, I was delighted to learn that two sequels have been announced, and I’m eagerly awaiting them. I’ll admit, on actually cracking the book open, the barrage of names, political affiliations, factions, and loyalties was a bit overwhelming, but a lot of that is down to my own reading preferences. The characters immediately won me over, and carried me past any initial difficulty in remembering who was loyal to who, and what each person had to gain by betraying/working with someone (or not). Cyril de Paul is a spy, who is vehemently in denial about his deep feelings for Aristide Makricosta, a flamboyant cabaret performer, and also a black market dealer in drugs, secret identities, information, stolen goods, and other things. Cordelia Lehane is one of Ari’s fellow performers at the Bumble Bee Cabaret, who agrees to run drugs for him and act as Cyril’s beard for her own ends. The relationships are complicated, but delicious. Every character has their own motivation, unfolded and explored more deeply as the novel progresses, and they are all fully realized, and beautifully drawn. The world is decadent and gorgeous, with settings, fashion, and meals described in loving detail. At the same time, the threat of political machinations, revolution, police crackdowns, and arrests, are never far from mind. The story is by turns heartbreaking, brutal, and tender. Watching Cyril and Ari deal with their feelings for each other, two characters who take great pride in their professions and never letting anything get past their armor, is wonderful and painful all at once. Similarly, witnessing Cordelia’s toughness and vulnerability as she deals with the changing reality of the world around her is incredible. She undergoes a harrowing journey, and emerges altered on the other side, but never betrays the core of who she is. 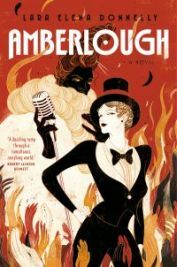 Amberlough is a story of shifting identities and loyalties, with everyone living a double or triple life, but with each character staying true to themselves. At the heart of everything, it is a story about found family and profound devotion, with everyone doing the best the can to protect those who mean the most to them. It’s a slick and stylish book, and a fantastic read to boot. 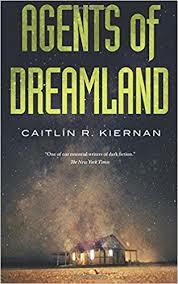 Caitlin R. Kiernan’s novella Agents of Dreamland is slick and stylish in a completely different way. Kiernan mashes-up Lovecraftian horror, suicide cults, off-the-books-men- in-black-style paranormal investigators, and real scientific phenomenon like Ophyiocordryceps unilateralis, the “zombie fungus”, which takes over ants and essentially forces them to do its bidding. An agent known as the Signalman is sent to investigate a suicide cult at a ranch house in the desert. What he and his fellow agents find there is horrifying – an unnatural scene of carnage with only one survivor. Following this harrowing discovery, the Signalman makes contact with Immacolata Sexton, a woman who also information about the cult to trade for what he knows. The narrative shifts between the points of the view of the Signalman, Immacolata, and Chloe, the sole surviving member of the suicide cult. The Lovecraftian touches are light, adding to the depth and richness of the story which feels like a small slice of a larger world. While the novella is completely self-contained, it does hint at a bigger story, with Immacolata seeming to be a semi-immortal being unstuck in time, and the Signalman being “a man with a past”. Chole’s viewpoint is particularly poignant, as a junkie caught up in the promise of a better world. The supernatural horror is grounded and lent extra weight with references to real life Heaven’s Gate cult, and the zombie fungus. As mentioned, the story feels like it takes place in a larger world, one that was unfolding before the reader arrived, and one that will continue after the reader leaves. At the same time, it’s a perfectly encapsulated bite of darkness, one with a strong and engaging voice. Lovecraft fans and non-Lovecraft fans should each find something to appreciate about this wonderful work. 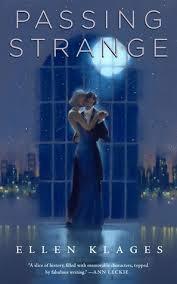 Last, but not least, another highly recommended work is Passing Strange, a novella by Ellen Klages. Like Agents of Dreamland, it’s a quick read, but one with a completely different tone. Set in San Francisco in the 1940s, the story focuses on a group of queer women who exist on the margins of society based on their sexuality, their ethnicity, and their relationship to their families. The story shifts between multiple points of view, which can be slightly jarring at times. While the information delivered in each section is crucial, and all the characters engaging, these shifts mean the story takes a while to hit its stride and find its heart. That heart is the romance between Haskell, a pulp artist, and Emily, a young woman who struck out on her own after being kicked out of boarding school for her relationship with a classmate, and disowned by her family for the same. Helen Young is also a central character, an American-born lawyer/dancer who plays up her Asian heritage for tourists at the Forbidden Palace supper club. The city of San Francisco is also a character in its own right, as is the World’s Fair, and Mona’s, a club primarily patronized by queer women. The story is a romance and a beautifully-told slice of life, and magic and the supernatural is woven in with a light touch. Helen can fold space and time through the art of origami, creating short cuts through the city, and Haskell has magic of her own, inherited from her grandmother. Art, queer life in 1940s San Francisco, and the wonder of the World’s Fair, all have integral roles to play in the story. As mentioned, the characters are all strong and engaging, even though the transition between their voices can lead to their stories feeling fragmentary at times. In the end, the shifting narrative isn’t truly a detriment. Dipping in and out of various characters’ lives gives a fuller picture of the city, making the world feel real, lived in, and well-populated. Haskell and Emily’s story is charming, and their relationship feels real. The first moments between them have genuine sparks, and that moment of passion only deepens as the story unfolds. Along with everything else, reading the story made me want to revisit San Francisco. It’s a magical city in multiple senses of the word, and Passing Strange accurately captures that. Now that I’ve recommended several recent reads I loved, I’ll close out with some upcoming titles I’m highly anticipating. Horizon by Fran Wilde, the final book in her excellent Bone Universe trilogy set in a world of man-made wings and cities of living bone. River of Teeth by Sarah Gailey, a novella about feral hippos in the swamps of Louisiana and the people who wrangle them. Stone Sky by N.K. Jemisin, the final book in the Broken Earth trilogy, a world populated by, among other things, powerful orogenes who can manipulate the earth itself. Shadowhouse Fall by Daniel José Older, the sequel to his excellent YA novel about graffiti and magic. A Song for Quiet by Cassandra Khaw, the follow up to her Lovecraftian novella, Hammers on Bone, this one centered on a Georgia bluesman on the run from trouble. The Beautiful Ones by Silvia Moreno-Garcia, a decadent historical romance. Buffalo Soldier by Maurice Broaddus, a steampunk-flavored alt-history with a dash of espionage thrown in for good measure. Mad Hatters and March Hares edited by Ellen Datlow, an anthology of stories inspired by Alice in Wonderland. The Refrigerator Monologues by Catherynne M. Valente, a series of inter-connected short stories taking on the friged woman trope. An Unkindness of Magicians by Kat Howard, a novel about magicians in New York City vying for control of a dwindling magic. The Red Threads of Fortune and The Black Tides of Heaven by JY Yang, a pair of novellas about twins who may just be the key to the fate of their world. Her Body and Other Parties by Carmen Maria Machado, a short story collection from a brilliant author. So You Want to Be a Robot and Other Stories by A. Merc Rustad, a story story collection from a wonderful author, exploring sexuality, humanity, gender, and much more. That’s by no means a comprehensive list of the books I’m looking forward to, but it’s a good start. Of course it doesn’t even touch on all the books I still need to catch up on either. If y’all could slow down with the writing of fabulous things for a while, it would really help me out. I hope and trust that things don’t slow down, for you or for us. Thank you for the reviews, madame!